AUTO (VC): When your G Unit Strides, choose 1 card from your hand, Call it to (RC), choose 1 of your Rear-guards, during that turn, it gains “CONT (RC): Resist”, and if that Rearguard has the Wave ability, it gains “CONT (RC): This Unit can attack from the Back-row”. AUTO (RC) 1/Turn Generation Break 2 Wave 1st or 4th: [Counter Blast 1] When a battle in which this Unit attack ends, you can pay the cost. If you pay it, this Unit Stands. CONT (RC): If you have a “Thavas” Vanguard, this Unit gains “CONT (RC): Resist”. AUTO (RC) GB1 Wave – 1st or 4th: [Soul Blast 1] When this card Boosts, if you have a “Thavas” Vanguard, you can pay the cost. If you pay it, your opponent chooses 1 of their Rear-guards, Retire it. AUTO (RC) 1 /Turn Generation Break 1: [Counter Blast 1 & Choose 1 “Blue Wave” card from your hand, discard it] When this Unit attacks, if you have a Vanguard whose original name includes “Blue Wave”, you can pay the cost. If you pay it, during that turn, this Unit gains “AUTO (RC) 1/Turn: When your Vanguard attacks, Stand this Unit, during that turn, this card gains Power+2000.”, and if this the first battle of the turn, Stand this Unit. ACT (RC/Hand): [Bind this card face-up] Choose 1 of your Locked cards, Unlock it, during that turn, it gains Power+2000. AUTO (RC): [Place this Unit on the bottom of the Deck] When your Ride Phase begins, if you have a “Liberator” Vanguard, you can pay the cost. If you pay it, during the next time you would pay the Cost for Stride, you can pay it as “Counter Blast 1 – “Liberator” card”. ACT (RC) Generation Break 1: [Counter Blast 1 & Petire this card] If you have a “Liberator” Vanguard, choose up to 2 of your “Liberator” Vanguards, during that turn, they gain “AUTO (RC) When your Unit is placed on (RC) from the Deck, during that turn, this Unit gains Power+3000.”. AUTO (RC) Generation Break 1: [Soul Blast 2 & Retire this card] When your Vanguard becomes Engorged, you can pay the cost. If you pay it, Draw 1 card, Counter Charge 2, choose up to 2 of your Units with the Engorge ability, during that turn, they are Engorged. ACT (RC) Generation Break 1: [Retire this Unit] Choose any number of your Rear-guards, change their locations, Draw 1 card. AUTO Generation Break 1: When this card is placed in the Drop Zone from the Damage Zone, Soul Charge 1, and if this card is placed by the effect of a Rescue Ability, you can Call this card to (RC). CONT (Deck/Hand): This card is also treated “Fantasy Petal Storm, Shirayuki”. AUTO (VC): [Choose cards from your hand whose Grades total 3 or more, discard them] When this Unit attacks or is attacked, you can pay the cost. If you pay it, choose 1 of your opponent’s Vanguards, for each of your “Shirayuki” Units, during that battle, it loses Power-10000. 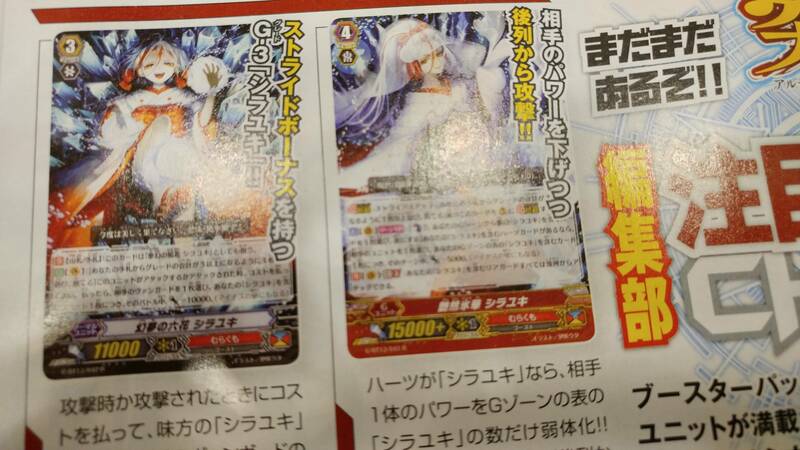 ACT (VC) 1/Turn: [Counter Blast 1 & Choose 1 face-down “Shirayuki” card in your G Zone, flip it face-up it] If you have a “Shirayuki” Vanguard, choose 1 of your opponent’s Units, then for each face-up “Shirayuki” card in your G Zone, during that turn, it loses Power-5000. CONT (VC) Generation Break ? : All of your “Shirayuki” Rear-guards can attack from the back row. AUTO: [Soul Blast 1] When this Unit is placed on (RC) from the hand, if your opponent has 3 or more Units at Rest, you can pay the cost. If you pay it, draw 1 card. CONT (RC) Generation Break 1: While this card is Successful, it gains Power+4000, and during a battle in which this Unit attacks, your opponent cannot Call Grade 0 cards from their hand. Bloom – AUTO (VC/RC) 1/Turn Generation Break 1: During your turn, when another of your Units with the same name as this Unit is placed on (RC), during that turn, this Unit gains Power+10000, and if this Unit is your Vanguard, it gains Critical+1. Dumjid pulls off his secret plan as Chrono recovers. However, Tokoha stands in Dumjid’s way, and thanks to the phantom of Migel, Tokoha is entrusted with a card that is capable of standing up against the terror of a Zeroth Dragon! Arata and Makoto reunite with Hoshizaki Noa, who appears to have been freed from the grasp of Chaos Breaker. However, Gredora and Darkface, in pursuit of Chaos Breaker, attacks the trio.